NEW YORK, NY--(Marketwire - April 29, 2010) - A survey of New Yorkers by Duane Reade found that nearly four out of 10 residents own at least six reusable bags, or eco-totes, yet almost half of all respondents still must make extra trips to the grocery or drug store to buy items they simply can't carry home in one visit. The Duane Reade "Schlep" Survey, conducted April 8-15, polled 1,628 New Yorkers to get their take on everything from the average number of bags they carry home from their local grocery or drug store to how they use their reusable shopping bags. The survey found that New Yorkers have embraced the reusable bag phenomenon, as nearly 40 percent said they own six or more "earth friendly" or "eco-tote" bags, while another 47 percent said they own one or two bags. Taken together, 87 percent of respondents own a reusable bag. "We're proud of New Yorkers for fully embracing the reusable bag concept," said Joe Jackman, Acting Chief Marketing officer of Duane Reade. "In creating our newest bag, we tapped into their fashion sense and no-nonsense nature. Further, in choosing the bag's name, Urban Luggage, we wanted to demonstrate just how much this deceptively big bag can hold." 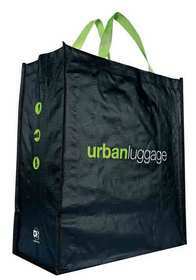 The survey coincides with Duane Reade's offering of its new "Urban Luggage" tote bag. The gender-neutral, chic and practical bag is priced at 99 cents (with a Duane Reade FlexRewards card) and can be used to "schlep" home the dozens of recently launched eco-friendly and organic products offered by Duane Reade. When asked if they are able to take home all their desired purchases from the grocery, drug or convenience store in one trip, 44 percent of New Yorkers said they need to take extra trips every week to buy items they were unable to carry home in their primary visit. Duane Reade also found that New Yorkers are putting their reusable bags to various uses beyond shopping for essentials. Nearly half of the respondents, 49 percent, said they use their reusable shopping bag as a "commuter carry-all," while 17 percent said they use it for "storage." Less than 30 percent said they use it solely for taking home their purchases from the store. Furthermore, half of all New Yorkers, according to the survey, carry home an average of three to five bags from their local drug or grocery store during a typical shopping trip. Not surprisingly, a slightly higher percentage, 54 percent, said that this range of bags is the maximum number they can or are willing to carry home. Founded in 1960, Duane Reade is the largest drugstore chain in New York City. In keeping with the company's brand vision of New York Living Made Easy, Duane Reade provides New Yorkers with prescriptions, health products and services, beauty products and services, food and convenience items for daily life in the City... everything for "How I Feel," "How I Look," and "What I Need Now." Duane Reade operates 250+ stores throughout the metropolitan New York region and is part of the Walgreens family of companies. The Duane Reade 'Schlep' survey found that New Yorkers often can't carry everything home in one trip to the store. The new 'Urban Luggage' reusable bag from Duane Reade should help New Yorkers 'schlep' home more from their trips to the grocery or drug store.